Residents evacuating their homes in in Makassar, the southern part of Sulawesi island, on Jan 23, 2019. MAKASSAR, Indonesia - In the Indonesian city of Makassar, where the rainy season often brings floods, Ms Hasriani didn't worry when a day-long downpour last month saw water rise to her knees by the time she had picked up her children from school for afternoon prayers. But within an hour, the water level had climbed above her head, threatening to drown her family inside their home, already built a metre off the ground. "It wasn't caused by the rain - it was Bili-Bili!" said Ms Hasriani, 30, referring to a dam completed in 1998 in order to prevent flooding, located some 15km away. In late January, the dam overflowed, unleashing run-off from the mountains that swamped thousands of homes close to the city. Disaster officials were shocked that one intense bout of rain could cause the dam to fail. But the provincial governor and environmental experts believe it could have been predicted. Earth shaken loose by years of forest-felling in the mountains above the city had been washed down into the dam's reservoir, they said, silting it up and displacing water. The dam burst swallowed up thousands of homes and hectares of rice fields across South Sulawesi province, killing about 80 people and affecting more than 13,000 - the worst disaster in at least 15 years. On mountain slopes, unanchored soil triggered landslides that ate up houses and damaged bridges. 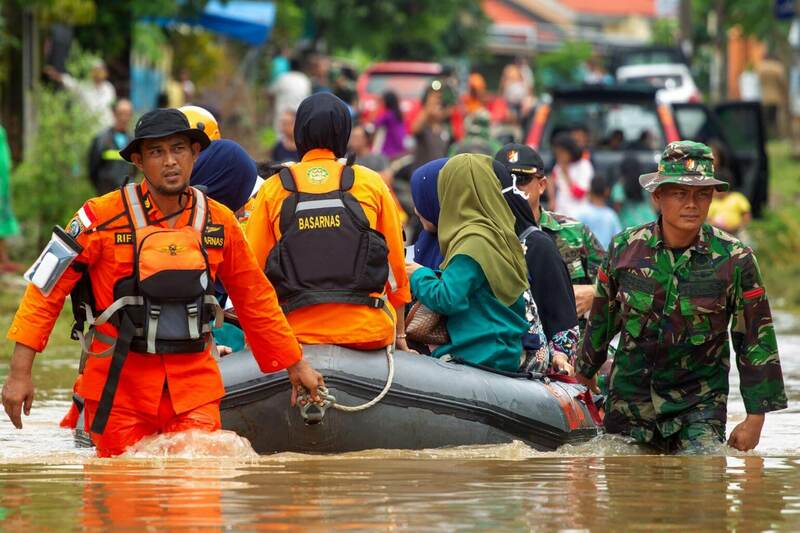 Of the thousands forced from their homes, many had yet to return, said Mr Ikhsan Parawansa, head of the disaster agency in Gowa district, where 56 died. Residents were unprepared for the failure of the 20-year-old dam and the resulting scale of the flooding. But the disaster holds lessons as the planet's climate heats up, and scientists warn of worsening extreme weather. Speaking to the Thomson Reuters Foundation shortly afterwards, South Sulawesi Governor Nurdin Abdullah rejected the media's portrayal of the disaster as "natural". "That dam was intended to last 100 years," he said. A university lecturer in forestry, Mr Abdullah - who took office in September - blamed human activities for exacerbating the effects of heavy rains. "There is a lot of mining and land conversion that increases silting and fills the rivers with dirt," he said. Turning forested land into fields or mining it for rock and sand removes the vegetation that holds the soil together. Then, when it rains, the dirt is easily washed down into rivers and lakes, reducing their capacity to hold water. The Jeneberang river system that flows into Bili-Bili has been designated as a conservation zone, with forests judged to be at "super-critical" risk of being cut down. Nonetheless, mining and land conversion that flout regulations have continued, Mr Abdullah said. Ms Putri Nurdin, a doctoral student at Japan's Kyushu University who is also the governor's daughter, analysed three river systems stretching across the province and found that no more than a fifth of the land was still covered in forest. "Where there should have been forest, I saw rice fields and housing," she said, describing a visit three days after the disaster. There were landslides all along the road, she added. Indonesia is said to be both blessed and cursed with abundant resources, including gold, nickel, copper, and the rock and sand needed for cement. Its natural riches have brought huge foreign investment to the country of 17,000 islands. But their exploitation has often sparked tensions between government and communities. President Joko "Jokowi" Widodo put agrarian reform high on his agenda in the 2014 vote. But with elections looming this April, he has yet to respond to demands for reform of land-use policy. As Sulawesi's mountainous terrain makes oversight difficult, small-scale farmers have seized the chance to capitalise on the ground beneath their feet, to grow crops and mine sand. When researcher Nurdin surveyed the mountains after the floods, she found unregulated mining activities that endangered the surrounding area, such as digging too close to pockets of sand that could cause landslides. Governor Abdullah said January's devastation had prompted a more aggressive review of permits and rules. Central government funding would also allow the province to build a second flood-prevention dam near Bili-Bili, he added. Ms Nurdin called for education to help communities use land more responsibly. Tree-planting programmes, backed by the government and other organisations, are underway but cannot keep up with the fast pace of deforestation, she noted. Mr Abdullah, who formerly headed a small district in South Sulawesi, ran for governor on a pro-conservation platform. He surprised voters by saying the province was no place for mining and palm oil production, and land developed for those purposes should immediately be restored by planting trees. "Usually if the forest is still healthy and there's rain for two hours, the river is still dry," Mr Abdullah said. "But now if there's rain for two hours, it definitely floods." Mr Parawansa, tasked with overseeing recovery in the worst-hit area, said Gowa district had set up trauma centres and shelters for those made homeless while their homes are repaired. "We're still trying to figure out why this happened, because it was so big, and we haven't seen something like this in a long time," he said. The full scale of the damage is still being worked out. But Indonesia's ministry of environment and forestry has promised almost 200 billion rupiah (S$19.5 million) in recovery funds. Ms Hasriani, who lives on a street of now-destroyed shops where her family sells rice and petrol, lamented the loss of her merchandise, computer, TV, phone and many clothes. The neighbourhood, located in a dip, filled up like a sink. "We just found high ground as quickly as we could," she said. "We couldn't save anything."